Traditional Digital Cable TV and new XFinity on Campus television streaming service is provided to all students living on campus. Cable TV service is provided in all WWU residence halls, and students wishing to use the service must supply their own TV and coaxial cable. The following information and instructions should help you set up and troubleshoot your TV. Your TV must have a QAM tuner, or you will need a converter box (example, although not specifically endorsed by ResTek) that will tune a digital QAM signal. Most televisions manufactured since 2006 have a QAM tuner. If your television does not have a QAM tuner, you can buy a new TV or purchase a digital-to-analog converter box. Again, be sure to check the manufacturer’s specifications of any TV or converter box you purchase to make sure it is QAM compatible, not just ATSC or NTSC, because some TVs and many converter boxes are not. The cable port can be found in the bedroom of your residential hall. There is one cable port per bedroom in each residential hall. In suites such as Birnam Woods, BT East, and the triple bedrooms in Buchanan Towers, the cable ports are located in the living room space. 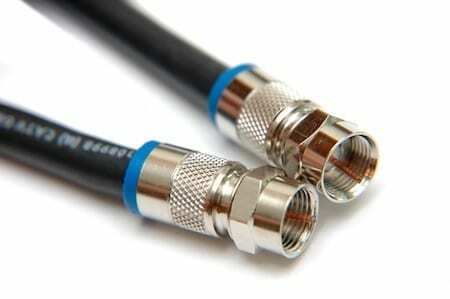 Attach the Coaxial Cable to the back of your TV. Attach the other end of the Coaxial Cable to the wall jack. The Channel Search may take a few minutes, once it is finished you should be able to view all of the available channels. The channel list can be found here. Make sure that your TV is set to Cable instead of Antenna. On your remote, find and press the “Menu” or “Settings” button. Try a different TV with your original Cable. Try a different TV with a friend’s cable. Ask a friend or neighbor to see if you can try their cable port, and go through the first 3 steps again. If it works, then there might be a problem with your Cable port. Still having troubles, Call ResTek and they can contact Telecom to fix a port problem. Look through the list of options and find the “Auto Program” option. If you can not find this option, look in your manual for this function. Enable the “Auto Program” and let it run through all the channels. It will take out most (if not all) of the empty signals. QAM (quadrature amplitude modulation) is the format by which digital cable channels are encoded and transmitted via cable television providers, including CWRU. A QAM tuner is the cable equivalent of an ATSC tuner which receives over-the-air digital channels broadcast by local television stations. Many new cable-ready digital televisions support both of these standards. Because there is no requirement, though, some very inexpensive manufacturers or models may not include the QAM tuner.Please be advised that less expensive TVs sometimes come with a lower quality QAM tuner that may be unable to tune all of the channels. We have found this to be true of bargain brands such as Dynex, Insignia, as well as some low-cost models from Visio. If that is the case a digital conversion box can be purchased. An ATSC (Advanced Television Systems Committee) tuner, often called an ATSC receiver or HDTV tuner is a type of television tuner that allows reception of digital television (DTV) television channels transmitted by television stations in North America. The FCC required all television manufacturers to include an ATSC tuner in all products since 2007, and required television broadcasters to switch in 2009. This type of tuner is currently included in all new televisions, including the inexpensive “digital conversion boxes” that were widely available leading up to the 2009 switchover. We have compiled the following information about television compatibility, and provide this list an informal reference for newer devices. This information is not intended to be complete. ResTek cannot guarantee the accuracy of this information. You should verify the specifications when you make a purchase. Contact ResTek if you need any assistance. Please notify ResTek if you have any information to add to this list. XOC is an IPTV streaming service offered by Comcast for colleges and universities as their on-campus TV service solution. Watch your favorite shows, movies, and sporting events at anytime, anywhere on campus. Watch shows using your school credentials to login to over 90 TV Everywhere apps when off-campus. Additional XOC services (Showtime, STARZ, as well as the Sports Entertainment Package) can be purchased directly from Comcast once your WWU account is activated. If your TV and your computer has HDMI ports, you can connect your TV to your computer using an HDMI cable. For full access, you must connect to WWU internet. Some services may not work off-campus – see Streaming Location below. For full access, you must be connected to the campus network – either wired Ethernet or WiFi. Some features may not be accessible off campus, including streaming live TV. See the detailed list below. These are TV’s or streaming devices that are connected to the internet via and ethernet cable or wifi and provide access to streaming services such as Hulu or Netflix. These can include Smart TV’s, Roku’s, Apple TV’s, game consoles, etc. Devices such as Smart TV’s and streaming devices that do not have browsers will be able to connect to the ResTek-alt network once the MAC address of the device is registered. For most devices the MAC address can be found in the device settings, there are more instructions on our Other Devices page.